My Card Attic: The Last Post . . ! The Last Post . . ! Only for 3 weeks, as I will be away with no access to the internet - I know, I've only just started it, right? But, I promise that when I regain access once again. I will try to post on a regular basis. 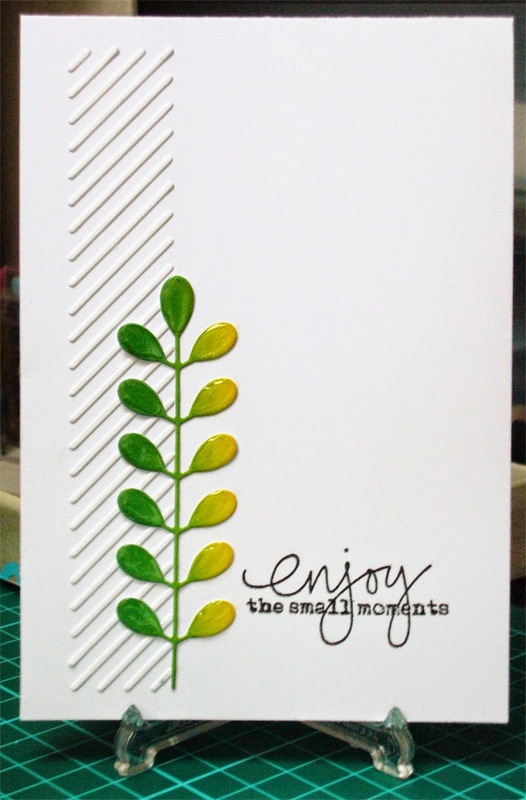 Anyway, this is a CAS card that I made with my Simon Says Stamp 'Air Vent' die (the negative part) and a Memory Box die (I think?) leaf stem, coloured with watercolour inks, covered with Wink Of Stella in clear and a liberal coating of Glossy Accents. I was quite pleased with the end result . . . this is my kind of style. Let me know if this is your kind of style, or what you are into at the moment. And now for something different . . !